Otto Heino was a man who dedicated his life to his passion. In doing so, he was rewarded with serenity, true contentment and peace of mind. He was born to share his gift with others: his students, his patrons and most significantly, his spouse of 47 years, Vivika. The Heino story is uniquely American; one of artistic talent, disciplined mastery and commercial success shaped by the post-World War II era. As a 33-year old veteran of Air Force gunner flights, Otto returned to New Hampshire where he had grown up on a farm; the fifth of twelve children. 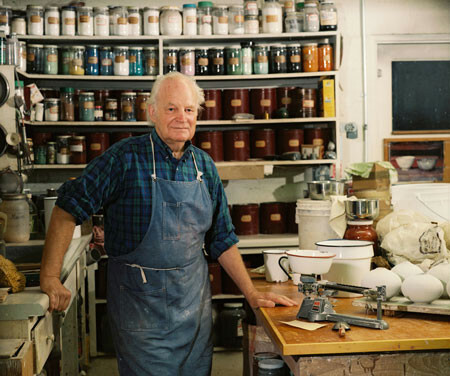 He met a pottery teacher while she was walking to her class in the summer of 1948. He enrolled in her class on the GI Bill, excelled, fell in love and they married. Vivika and Otto’s resulting artistic partnership was so balanced that the artists shared equally in the creative process down to the signing of both their names on each piece they produced. Together, they played a significant role in advancing the North American tradition of pottery-making with a body of work that is an award winning presence in shows, museums, galleries and collections world wide. Their introduction to western culture of the eastern tradition of creating “kiln gods” (to ensure a successful fire) is now widely practiced among western potters. With Vivika’s passing in September of 1995, Otto continued to work by himself. Ceramics authority Val Cushing described Otto as a “thrower of extraordinary skill with a sensitive eye for the classical form.” A practical and plain-spoken man with an around-the-clock work ethic, Otto said, “I let the clay work for me. I just guide it.” Otto said that the students, “hundreds of them” he and his wife taught throughout the years at institutions, including the University of Southern California, the Chouinard Art Institute and the Heino’s own studio, were the couple’s only children. It was Beatrice Wood, perhaps the most famous student of the Heinos, who persuaded the pair to settle in the Ojai Valley and sold them her own house complete with kiln. Otto Heino’s life is proof that commitment to one’s craft can be artistically, spiritually and personally rewarding. Otto Heino’s documentation took place in 1996 and 1998 and was sponsored by Ojai Studio Artist. The FOTM Archive contains extensive information about this artist.